This sculpture was inspired by a small natural invertebrate form found in a Cambridge, England museum. The sensuality and liveliness of the form was compelling, and as a sculptor, I worked with this form in many small prints and editions. I decided that it would be powerful at a larger scale, where it truly conveys a sense of life and animation. In a sense, it conveys the will to become alive, move, and evolve. Its dramatic patina gives it a painterly and expressive surface, enhancing its sense of surface expressiveness and presence. 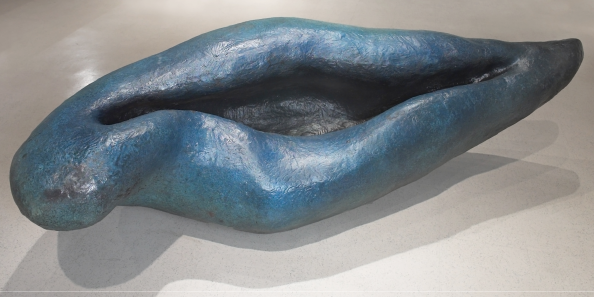 Laser scanned and enlarged from the small studies, Verta was sand cast in seven sections at the ASU foundry by the sculptor, assembled, and colored with a vivid cobalt blue patina. Edition 2/3.